The mission of NWD Projects, Inc. is to promote dance as a voice for environmental awareness through collaborations with the artistic, educational and environmental communities. 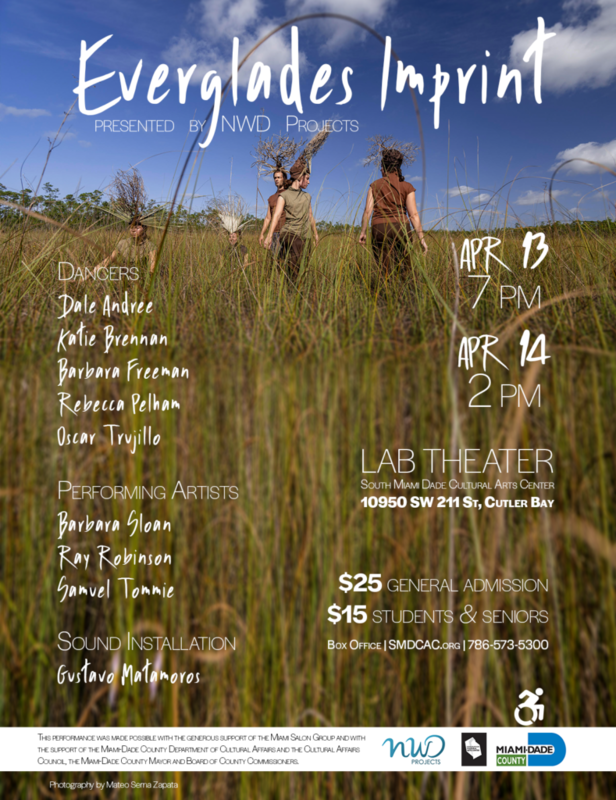 On Saturday, April 13th at 7pm and Sunday, April 14th at 2pm at SMDCAC Lab Theater witness the wild beauty and fragile ecosystem of the Everglades come alive at the Everglades Imprint performance. Inspired by Dale Andree’s fellowship at Everglades National Park through Artist In Residence In Everglades (AIRIE), the dance performance by NWD Projects dancers Katie Brennan, Barbara Freeman, Rebecca Pelham, Oscar Trujillo will include narration from award-winning South Florida actor, Barbara Sloan and Seminole Nation citizen Samuel Tommie, with a sound installation by Gustavo Matamoros, overlaid by Samuel Tommie’s flute and Ray Robinson’s percussion. Photographs by Miana Jun will present the multi-layered magic of the Everglades. Tickets are $25 for the general population and $15 for students and seniors. Purchase tickets in person at the Box office (10950 SW 211 St, Cutler Bay), online at SMDCAC.org or by calling 786-573-5300. ADA Statement: It is the policy of Miami-Dade County to comply with all of the requirements of the Americans with Disabilities Act. The facility is accessible and Assistive Listening Devices are available in the Main Stage Auditorium and the Black Box Theater space. To request materials in accessible format, and/or any accommodation to attend an event at the South Miami-Dade Cultural Arts Center, please contact Stephanie Aponte, 786-573-5314, saponte@miamidade.gov, at least five days in advance to initiate your request, TTY users may also call 711 (Florida Relay Service). 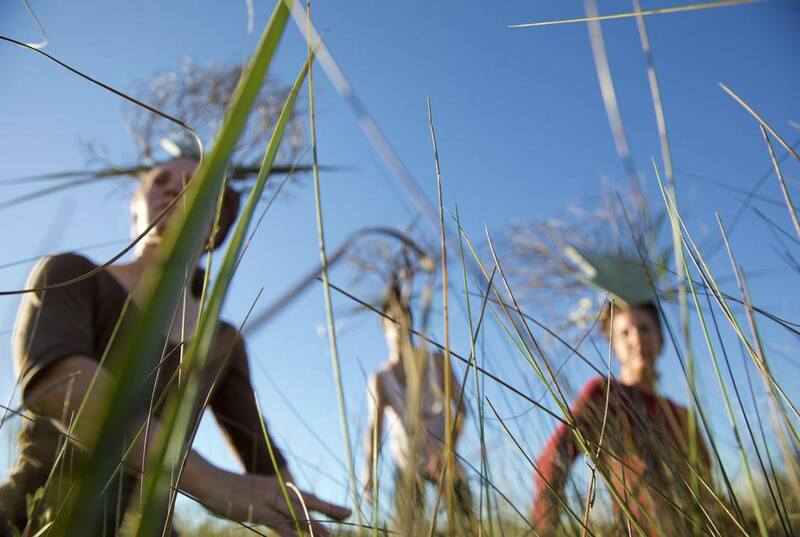 These events would not have been possible without Artist in Residence in Everglades. AIRIE’s purpose is to inform, connect, and support artists, writers and musicians who wish to be ambassadors for the Everglades by providing month-long residencies in the Park. Everglades Imprint is sponsored in part by the Miami-Dade County Department of Cultural Affairs and the Cultural Affairs Council, the Miami Dade County Mayor and Board of County Commissioners and the Miami Salon Group. 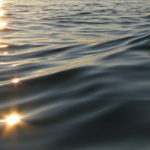 “Whoever you are, whatever you are, water is your human right. - The government has NOT shut us down! Come join us on December 30 and bring in the New Year with Dance in the Everglades! If the government remains shut down, there will be NO park entrance fee for personal vehicles driving to the Everglades Imprint performance site. Please read the flyer below carefully for details! when all community members have the ability to participate. Please contact us for more information or to request specific accommodations.